The Beocenter 3500 marked a welcome return to the B&O range of a combined receiver and turntable, for there had been none since the Beomaster 900 RG Compact radiogram was dropped in 1971. Perhaps surprisingly, this was a very easy model for B&O to make, as all the parts already existed. The tuner/amplifier chassis and front panel was the Beomaster 3000, the only change being the addition of a 110V tertiary winding on the power transformer to power the turntable motor. The turntable was the Beogram 3000, which as different only in as much as the speed control was altered so that in came out as a knob of the top surface (previously a thumb wheel on the side), similar to that of the Beogram 1800. The result of combining these two high quality units (both were near the top of the range when introduced) was an excellent music centre, far exceeding any other on the market at the time in terms of quality and appearance. The 40 watt power output was unusually high, even for a separates system, and few (if any) music centres could match it, and few offered a quality magnetic pickup or preset FM stereo radio either. Text copyright © Beocentral. Unauthorised reproduction prohibited. Loudspeaker choice was anything in the Beovox range, though the sales leaflet showed the Beovox 3800, a large three way model rated at 50W. Text copyright © Beocentral. Unauthorised reproduction prohibited. The system could be expanded with a tape recorder, such as the Beocord 1800 open reel machine. The switching allowed the off-tape monitoring function to be used through the loudspeakers of the Beocenter, so really good recordings of radio programmes or records could be easily made. A second turntable could also be connected. This facility seemed of little use, and is because of the Beomaster 3000 roots. The Beomaster 3000 could be used either with a magnetic pickup (such as the SP6/7 of the Beogram 1000V or the SP 10A of the Beogram 1800) in the first socket, or with a Beogram with a built in amplifier/equaliser (such as the Beogram 1000 VF) or another turntable with a ceramic cartridge in the second socket. Both these sockets were duplicated as DIN and RCA types, and there were two switches of the front panel. Text copyright © Beocentral. Unauthorised reproduction prohibited. 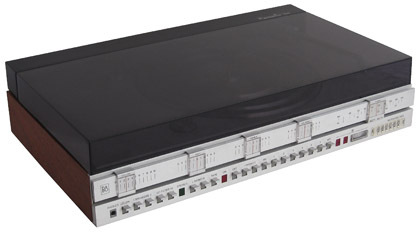 The Beocenter 3500 had the built in turntable connected to the magnetic socket via a short flying lead, but the other socket and switch remained in place. This found other uses though, for it would directly accept sound take off from a television (the Beovision colour and monochrome ranges could both have suitable sockets fitted), an 8 track cassette player (though B&O never made one), and later on, a compact disc player such as the Beogram CD X, whose RCA plugs connected directly with the duplicated sockets on the Beocenter with no modifications! The loudspeaker inputs from the Beomaster 3000 also remained, and could be used in the same way. Text copyright © Beocentral. Unauthorised reproduction prohibited. In its last year of production, the Beocenter 3500’s front panel became black, with green crosshairs in the sliders, matching the appearance of the Beomaster 4000. The chassis was not upgraded to Beomaster 4000 specification though, so the power output did not rise to 60 watts, and Ambiophonic facilities were not added. The Beocenter 4600 displaced the 3000 from the range, but was only rated at 25 watts. Text copyright © Beocentral. Unauthorised reproduction prohibited. A proper replacement for the Beocenter 3500 came in 1980, when the Beocenter 7000 arrived. Text copyright © Beocentral. Unauthorised reproduction prohibited.